Neck bones are the original “where’s the meat” dish! The emphasis for original soul food was never on a lot of meat, in fact it’s a cuisine with heavy emphasis on sides. Why? Well probably because meat was scarce! The slaves got the scraps, leftovers and parts that the people who owned them didn’t want. I think that’s why we have so many great soup, stew and casserole recipes because these dishes contained a little meat to season the dish but were filled with vegetables, beans, rice, potatoes etc. Today modern soul food recipes are a lot heavier on the meats. Ribs, pork chops, meat loaf, fried chicken, roasts – etc., was not food that would have been available during slavery. 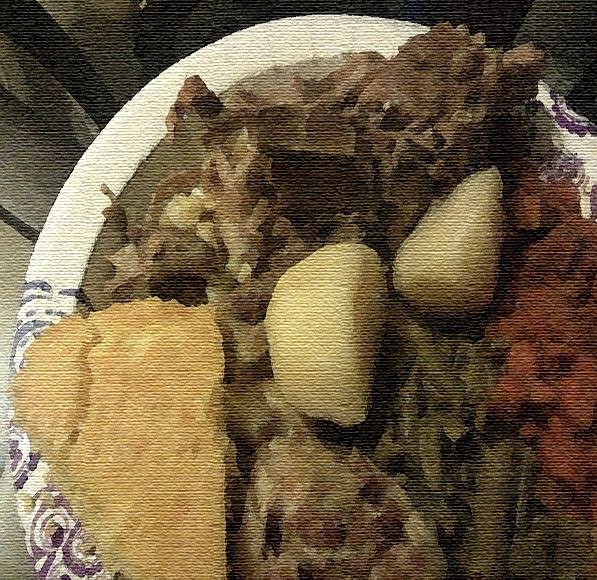 Recently, I had a plate of neck bones and potatoes. I hadn’t eaten this dish in years and it was really good! It reminded me that southern/soul food originally didn’t rely heavily on a lot of meat. The dishes relied on flavor and fresh ingredients – farm to table was the way of life. Slaves ate what they grew and scavenged with a little bit of meat thrown in here and there when they could get it. Put all ingredients except potatoes into a 6 quart stock pot. Cook over medium flame about 1½ hours. Add 3 lbs. of quartered potatoes. Cook another 20 minutes or until potatoes are tender and meat falls off the bone. Serve with corn bread and your choice of vegetable. Don't forget the hot sauce! I followed the recipe and the neck bones and potatoes was delicious!! Thanks Bridgett! Just saw your comment but I’m so glad you like the recipe. I love neck bones and potatoes! When do I add the potatoes if cooking in a crockpot?? For a crock-pot it gets a little tricky because you don’t want your potatoes to cook up to the point where they fall apart. With neck bones and potatoes you want the potatoes to remain intact. You’ll want to add them near the end of your cooking time. It will depend on the crock-pot’s temperature and the amount of potatoes your cooking but I would say 45 minutes to an hour before you’re ready to eat. You can put them on top of the neck bones, season them with salt & pepper, and let them basically steam until done. To check to see if they’re done, take one out and mash a piece of it with a fork. I like to serve 3 or 4 quarters to each person as a side. If you’re feeding kids (or me! 🙂 ) , you can add a pat of butter and mash them up with a fork right on the plate! Good eating and soul good! Hi Paul, yes add water to cover 1 to 2 inches above ingredients. Thanks for the catch, I updated the recipe. I’m making these this week, been having a taste for some good ole neck bones and potatoes ? I followed your recipe, and I cant thank you enough Miss.Char. I threw in a bag of black-eyed peas, a little love, and when it was all ready you can see the smiles on my entire family’s faces. Do you ever bake them. The recipe I saw at Harvey’s were with potatoes,Brocolli, carrots and necklines. It looked like they were baked. No, I don’t think I’ve ever baked them but that should be good, just like doing a roast, right?! If you do them that way let me know how you like them! I might have to give them a try! How do i cook the potatoes when my neckbones are done.? Hi LaShae! I just saw your message and the best way to fix neckbones and potatoes is to cook the potatoes in the same pot as the neckbones. The neckbones will have a lot of broth in the pot and when they’re just about done, add cut up potatoes to the pot, on top of the neckbones. They basically steam in the broth because they cook on top of the neckbones. The neckbones & broth also flavors them. Cook the neckbones and about 45 minutes before they’re done (meat is done but not falling off the bone), add the potatoes on top. Sprinkle with salt & pepper. About 5 minutes before serving, add butter on top of the potatoes in 5 or 6 places so all potatoes have some butter. Have butter on table for people who want to add more on the potatoes they put on their plate. Serve and enjoy!!! Hi Kevin! Start with cold water, cover the neckbones in water and you can add a couple stalks of chopped celery and a chopped onion. Water should be 2 to 3 inches above the neckbones. Season with salt, pepper, onion & garlic powder or whatever seasonings you like. When neckbones start to boil, skim the foam off that rises to the top of the pot and discard it. Cover & cook neckbones about 1 1/2 hours on medium high heat. Cooking the neckbones in water will make the broth by the time they are done. 30 t0 40 minutes before they’re fall of the bone done (they will be totally cooked, with small pieces starting to break away and just starting to fall apart) throw your quartered potatoes on top of the cooking neckbones. Sprinkle salt & pepper on the potatoes and let them cook/steam about 30 minutes or until done. You can test one piece of one of the potatoes on top to see if they’re done after 20 minutes. After potatoes are done, turn off heat and add tablespoons of butter in 4 to 6 places over the top of potatoes, let melt. You can serve more butter at the table to put on potatoes after they’re put on plate. Enjoy! Hi I ran across your recipe for neckbones I am from Texas now living in Arizona now. 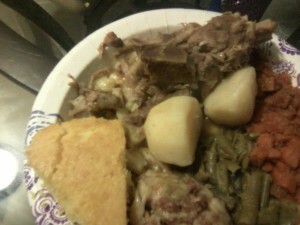 When I lived in Texas we ate alot of neckbones and oxtails. You kinda lose yourself when you leave home. Needless to say my now grown kids say it’s nasty I didn’t cook this type of food for my children they don’t consider these meats as soul food. My husband is 60yrs old and he loves the neckbones and oxtails (which is so expensive now). I lived in the country we had hogs and chicken and my had a beautiful garden with vegetables we never went to the as often as we do now. It’s need so long since I had these meats. I decided to cook some neckbones today I went online to find a recipe and ran across your recipe for neckbones. I just want to thank you for posting your recipes I will be looking you up for more great recipes.You have motivated me to cook again. Hi Michelle! I’m glad to hear you feel motivated to get back in the kitchen! You are so right when you say the younger people don’t really know what true “soul food” is! They didn’t grow up eating what we grew up eating so a lot of the cultural roots of what we ate is being lost. The sad thing is that they don’t know what they’re missing! The one thing that makes soul food so special is that you can actually taste the love in your food! Some people say it’s good that we don’t cook and eat the “old school” soul food recipes anymore because they are unhealthy. To me, the real soul food meals relied on side dishes with recipes that were heavy on vegetables and light on meat. Meat was scarce so “a little bit” was used to season a pot of soup, greens or beans. You can sit down and eat 3 or 4 neckbones and you’ll be hard pressed to find the amount of meat in a happy meal! Also, as you said, we grew our own food so we knew what we were eating! Greens, beans and foods that only we ate are now being prepared on the top food network shows! Maybe they weren’t all that bad after all! Today our food is so full of steroids, chemicals and GMOs, who knows what you’re putting in your mouth and your body! I leaned how to cook when I was13.GRANDMA AKA MAGDALENE HATTEN I’M 57 NOW.but I always love Neck Bones and Potatoes.and I still make it.I’M the cook of the Family. Hi Debra! You’re story sounds a lot like mine! I learned to cook early too, and I don’t know my exact age but I had to be somewhere between 11 and 13. My mom was a great cook and she taught me and my sisters. My mom loved pork so we ate it all, from the rooter to the tooter – the whole hog, for real! Back in the day, it wasn’t just about what you liked it was also about what you could afford especially if you had lots of mouths to feed! Take care and keep on cooking! Sweet Mother’s Kitchen – Cook. Share. Remember. The history along with the recipe turned out to be a soul satisfying meal.. a true blessing indeed .. thanks for opening your mind and heart to homes all over the world !! People like me NEED this? Hi Maia and thanks for your comments! I’m happy that you enjoyed the recipe! Peggy that sounds delish! Cornbread dumplings, yum! How about adding a recipe for them? A picture too if you have one! Thanks!